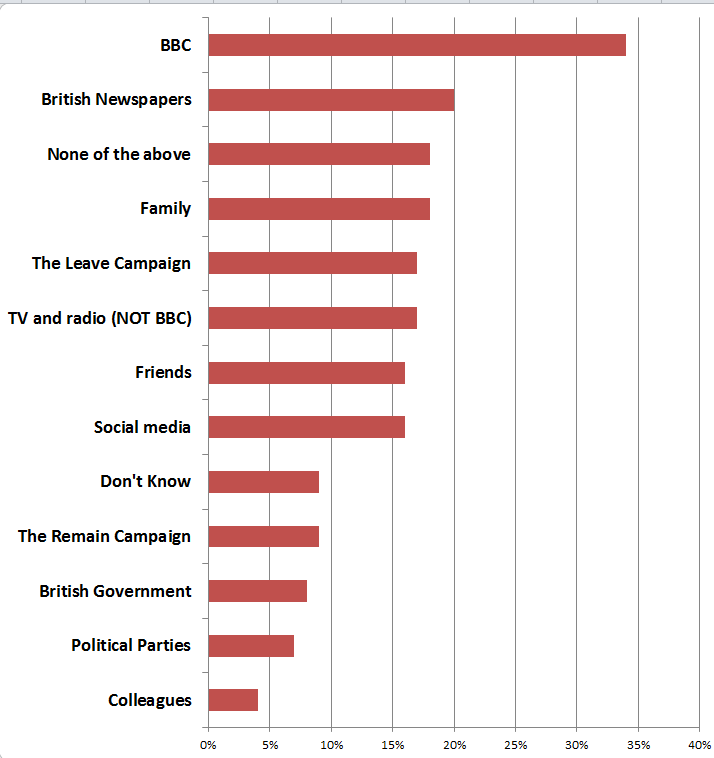 The BBC is the most important source of information on the EU referendum, according to a poll of eligible voters, with newspapers coming in second and social media also factoring. More than a third (34 per cent) of the 1,638 UK adults, polled by BMG Research on behalf of the Electoral Reform Society, put the BBC as one of their three most valued sources on the Brexit debate. 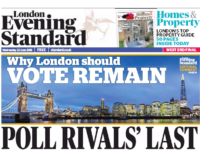 British newspapers as a whole, including regional and national publications, came in behind with 20 per cent of those questioned saying they were an important source on the referendum. Participants were asked: “Which of the following have been most important in informing your decision about the EU referendum so far?” and were told to choose three out of 13 options. Four of these related directly to the media. 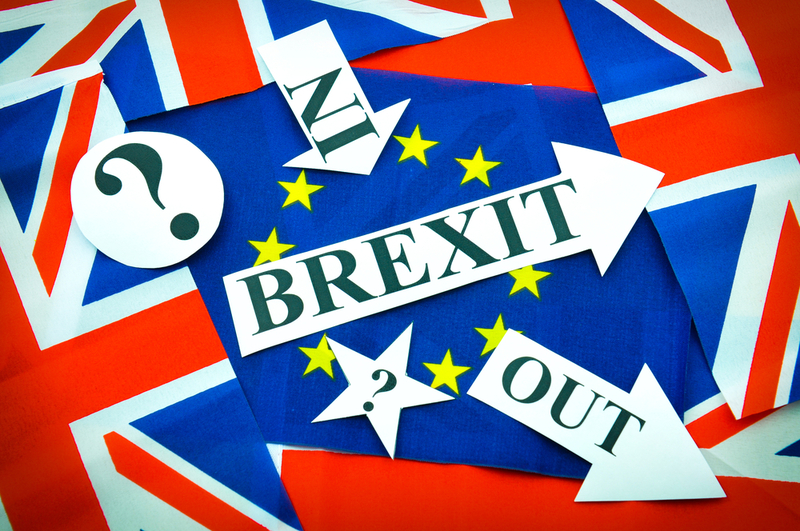 The findings, published the day before Britain goes to the polls to decide whether to leave or remain within the European Union, show a divide among younger and older Brits in terms of which sources were most valued. For 18 to 24-year-olds social media and friends are more of an influence than broadcasters or publishers, the figures show. 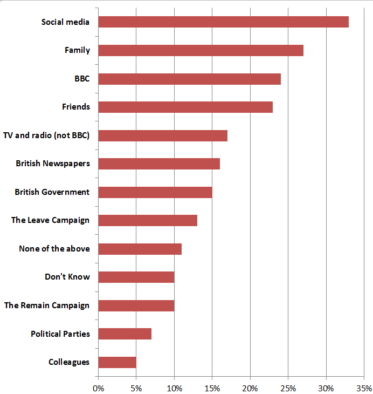 Overall, 16 per cent of those polled valued social media as an important source of information on the referendum. Of these, one third (33 per cent) are aged 18-24 while 8 per cent are over 65. Almost one quarter (24 per cent) of 18 to 24-year-olds valued the BBC’s coverage compared to 41 per cent of over 65s. 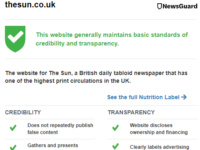 Similarly, almost double the proportion of over 65s (29 per cent) said British newspapers were their most important source of information compared with 18 to 24-year-olds (16 per cent). 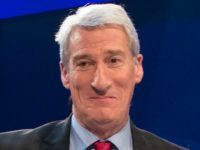 A total of 17 per cent said other British television and radio Broadcasters, excluding the BBC, were important sources on the referendum. 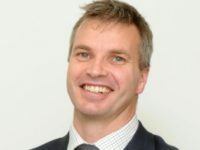 Katie Ghose, chief executive of the Electoral Reform Society, said: “While it’s great that people are getting their information about the EU from a variety of sources, in these last couple of days it’s crucial that voters get the facts and opinions from both sides to help them reach an informed decision. The Electoral Reform Society has launched Better Referendum, a free online community tool to give people a platform to talk about the issues surrounding the referendum.